Until this weekend, I’ve never seen a minor league baseball game. It was one of those things I felt bad about as a fan of the sport, but not bad enough to remedy the situation. I compared it to a movie buff that just never got around to watching the Manchurian Candidate or the third Godfather film. Unfortunate, but assuredly not inexcusable. Still, with spring slowly taking on the shape of summer, it was time to get sent down to AAA. 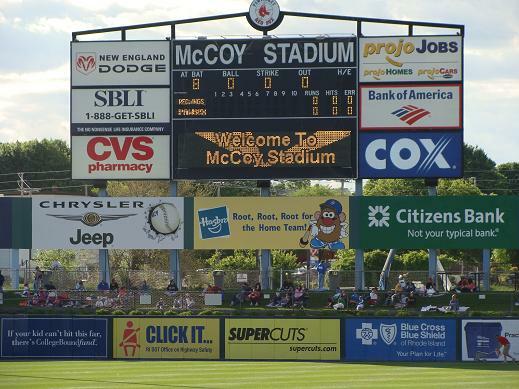 McCoy Stadium, home of the Pawtucket Red Sox, was built in a quirky little town in New England. Pawtucket sits in the northeast corner of Rhode Island, but might as well be in the middle of the country. It’s a town with one big factory, a diner, and an old mill, all easily accessible off I-95, which splits it down the middle. In other words, the Perfect Place for a minor league stadium. I drove down, parked for $2 in a lot a block away, and followed the crowd into the park. There was one main concourse at McCoy, which stretched from first base line to third base line. While the legends of $1 hot dogs and nearly free sodas at minor league ballparks were grossly exaggerated, the prices at the concession stands were still reasonable. Six bucks for a personal pepperoni pizza, four for fried dough and another four for ice cream in PawSox batting helmet dish. Not a bad investment at all.